Again, no big surprises here. The CSS contains rules for the page body, the wide header/footer boxes, the container, the #chart canvas element, and the #chartData table element. The #chart and #chartData elements are given a subtle gradient background, created using the image gradient.png (included in the code download). Yes, you can even have background images on canvas elements! The styled table containing the data. Now doesn’t it look lovely! This should be fairly self-explanatory. If not, you might like to read our other jQuery tutorials! Internet Explorer — bless it — doesn’t support canvas. (IE 9 might or might not, at the time of writing.) Fortunately some very clever coders created ExplorerCanvas, a library that emulates most of the canvas methods and properties using IE’s SVG capabilities. It’s not perfect, but it’ll do the job for us. Since only IE needs this library, we use conditional comments to load this library just for IE. We’ve linked directly to both these libraries on Google’s CDN, but you could just as easily download the 2 .js files and link to them on your own site. We’ll wrap our code in a main function called pieChart(). That way, we can keep all functions and variables related to the chart in one place, and not pollute the global scope. We’ll then use jQuery to call pieChart() when the page’s DOM is ready. To allow room for pulling out slices and displaying labels, we want the actual pie chart to be a fair bit smaller than the canvas. In this case, 55% is a good setting. Since we’ll be animating a slice as it pulls out from the pie, we need these variables to track the animation. currentPullOutSlice tracks which slice is being pulled out, or has been pulled out (a value of -1 means that no slices are pulled out), and currentPullOutDistance tracks how much the slice has been pulled out so far. This will hold the value returned by setInterval() when we create the animation. It’s a numeric ID that we can then pass to clearInterval() when we want to end the animation. We’ll use this array to store data about each slice in the chart, including its label and value (pulled from the HTML table), and its start and end angles. This array will hold the colour of each slice in the chart, again pulled from the HTML table. The last line of code calls an init() function, which sets up the chart and gets things going. We’ll write this function next! When drawing on a canvas, 0 radians is 3 o’clock. Since we want our pie chart to start from 12 o’clock, we use chartStartAngle to subtract π/2 radians (a quarter turn) from the slice angles when drawing the chart. Note that init(), as well as all the other functions we’ll create from now on, should go inside the outer pieChart() function. Functions within functions, where the inner function accesses variables declared in the outer function, are known as closures. First we get the "#chart" canvas element from the page and store it in an object called canvas. We’ll do all of our drawing on the canvas through this object. Before we do anything else, we should check that the browser actually supports the HTML5 canvas element. We do this by seeing if the canvas object contains the getContext() method — a frequently-used method that we’ll use later on. If it doesn’t, then the browser presumably doesn’t support canvas, so we exit the function. Since we’ll frequently use values like the canvas width, height, and centre, as well as the chart radius, we compute these values now and store them in variables for use later on. We use a jQuery selector — $('#chartData td') — to select all the data cells in the table. We can then iterate through these cells with the jQuery each() method. For each cell, we determine if it’s a label (e.g. 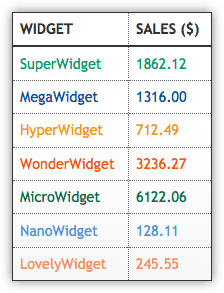 “SuperWidget”) or a value (e.g. “1862.12”) cell, based on whether it’s in the left or right column. We then store the cell contents under the 'label' or 'value' key in an associative array, which we then place inside the chartData array. While we’re looping through the table cells, we store the current row index (and therefore slice index) in a key called 'slice' inside the jQuery object holding the table cell. We do this using the handy jQuery data() method. That way, we can easily find out which slice a cell refers to whenever the cell is clicked on. We also assign a click event handler function, handleTableClick(), to the cell, so that when the cell is clicked on we can animate the chart appropriately. We’ll create this function in a moment. In the last part of the loop, we use jQuery to extract the colour of the cell by looking at its color CSS property. We then store its colour in the chartColors array, as a 3-element nested array containing the red, green, and blue values (in decimal). Most browsers return an element’s colour in the format "rgb(r, g, b)". However, some browsers (*cough* IE *cough*) simply return the colour in whatever format it was specified in the CSS (e.g. "#RRGGBB"). So our code uses regular expressions to check for both scenarios. We’ll need to know the angles at which each pie slice starts and ends fairly often throughout the code, so we’ll pre-compute them here and store them in 'startAngle' and 'endAngle' elements of the associative array inside chartData. We do this by looping through the slices, using currentPos to keep a record of the running total as a ratio of the grand total (between 0 and 1). 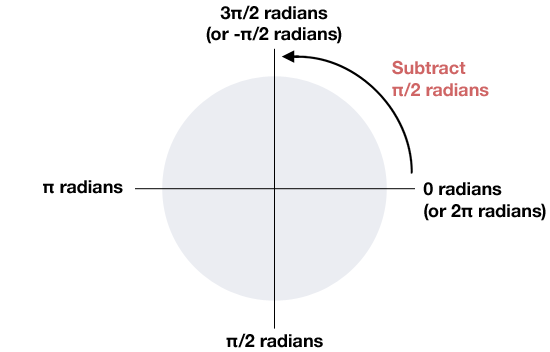 We can then multiply this running total by 2π radians (a whole turn) to get the start and end angles for each slice. The slice angles stored in chartData run from 0 to 2π (3 o’clock to 3 o’clock). We’ll need to offset these angles using the chartStartAngle variable when we actually draw the slices, so that the pie starts from 12 o’clock instead. Finally, our init() function calls a drawChart() function to draw the initial pie chart. (We’ll create this function later.) It also assigns a click event handler function, handleChartClick(), to the canvas element, so that when the chart is clicked we can pull out or push in a slice as appropriate. We’ll write this function next. We now need to write our handleChartClick() event handler function. 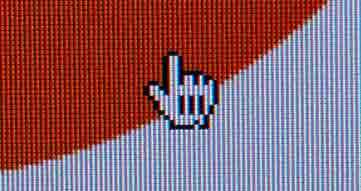 This is called automatically whenever the user clicks inside the canvas element. * Process mouse clicks in the chart area. * If a slice was clicked, toggle it in or out. * If the user clicked outside the pie, push any slices back in. // Was the click inside the pie chart? // Yes, the click was inside the chart. // Find the slice that was clicked by comparing angles relative to the chart centre. // Slice found. Pull it out or push it in, as required. // User must have clicked outside the pie. Push any pulled-out slice back in. As with all jQuery event handlers, handleChartClick() should accept a jQuery Event object as an argument. This Event object contains useful information about the click event, including the coordinates of the point that was clicked in the page. We can read the coordinates of the clicked point via the pageX and pageY properties of the Event object. However, these coordinates are relative to the page, so we need to subtract the coordinates of the top left corner of the canvas element to get the position relative to the canvas. Fortunately this is easy, since the this keyword in a click event handler refers to the clicked element (the canvas in this case). We can then read the element’s top left corner position using offsetLeft and offsetTop. Now we know what part of the canvas was clicked, we need to find out if it was inside the radius of the pie chart. We use Pythagoras’ theorem to work out the distance of the click from the centre of the pie chart. This distance is the hypotenuse of the right triangle formed between the x-axis position of the clicked point relative to the centre, the y-axis position of the clicked point relative to the centre, and the centre itself. If this distance is less than the chart radius then the click was inside the chart. Easy! Assuming the click was inside the pie chart, we then need to work out which slice was clicked. To do this, we first calculate the angle of the click relative to the chart’s x axis using the atan2() function. We subtract chartStartAngle from this value to allow for the fact that the pie chart is shifted a quarter turn. Also, since atan2() can return negative angles, we add the value to 2π if it’s negative, so that we’re always working with positive angles between 0 and 2π. Now we can loop through the slices until we find the slice whose start and end angles are either side of our adjusted click angle. That’s our clicked slice. * Process mouse clicks in the table area. The table click handler is, thankfully, a lot simpler than the chart click handler! Remember how, in the init() function, we stored the slice index with each table cell using the jQuery data() method? This makes it really easy for us to determine which slice to toggle based on the clicked table cell, by simply calling $(this).data('slice'). * Push a slice in or out. * If it's already pulled out, push it in. Otherwise, pull it out. As you can see, the function doesn’t do the actual pushing or pulling; it defers these operations to the pushIn() and startPullOut() functions, which we’ll write next. * Start pulling a slice out from the pie. The call to setInterval() passes in an anonymous function, which in turn calls animatePullOut( slice ). This is another example of a closure, since the anonymous function accesses a variable (slice) in the scope of the enclosing function. This ensures that setInterval() has access to the animatePullOut() function, as well as the value of slice. We also pass the interval, in milliseconds, to setInterval(), using the variable pullOutFrameInterval. This causes setInterval() to call animatePullOut() every pullOutFrameInterval milliseconds. setInterval() returns an in interval ID, which we store in the variable animationId. We can then call clearInterval() with this ID whenever we need to stop the animation. To highlight the table row, we first remove the 'highlight' class from all cells in the table, then we use the jQuery :eq() selector to find the 2 cells in the target row, and add the 'highlight' class to these cells. * Draw a frame of the pull-out animation. As you can see, this function simply adds the value of pullOutFrameStep to currentPullOutDistance to pull out the slice a few more pixels, then calls drawChart() to draw the frame. It also checks if the slice has been pulled out to its maximum distance (maxPullOutDistance). If it has, then the animation is stopped by calling clearInterval(). * Push any pulled-out slice back in. * Resets the animation variables and redraws the chart. * Also un-highlights all rows in the table. This function resets the currentPullOutSlice and currentPullOutDistance variables, clears any current animation by calling clearInterval(), redraws the chart to reflect the new conditions, and removes highlights from any cells in the table. * Loop through each slice of the pie, and draw it. // If there's a pull-out slice in effect, draw it. Since we’re likely to be drawing an animation frame, we first need to clear the canvas of any previous frame. There are a few different ways to wipe a canvas, but I’ve found that the clearRect() method produces the smoothest animation across a range of browsers. As you’d imagine, this clears a rectangular area of pixels specified by the top-left x and y coordinates of the rectangle, the width, and the height. Now we can loop through each slice in the chartData array and, skipping any pull-out slice for now, draw the slice by calling drawSlice(). We pass in the drawing context and the index of the slice to draw. Finally, we can draw the slice that’s currently being pulled out (or has been pulled out). We check if there is a pull-out slice by looking at the value of currentPullOutSlice. If there is, then we call drawSlice() once again, this time passing in the index of the pull-out slice. Why do we draw the pull-out slice last? Because the pull-out slice has a drop shadow. If we drew all slices in order then the slice after the pull-out slice would sometimes paint over part of the drop shadow. Which would look a bit uncool. * Draw an individual slice in the chart. // We're pulling (or have pulled) this slice out. // and add a drop shadow. Remember that the slice angles in the chartData array start from 0 radians (3 o’clock), but we want our chart to start from 12 o’clock. So we need to subtract a quarter turn from the slice angles before we use them to draw the slice. We do this using the chartStartAngle variable, storing the results in startAngle and endAngle. The next block of code checks to see if we’re drawing a pull-out slice. If we are, then we need to offset the slice from the centre. To do this, we compute the angle of the middle of the slice (halfway between the start and end angle), and work out the number of pixels to pull the slice out by multiplying currentPullOutDistance by the result of the easeOut() function (more on this function in a moment). We can then use simple trigonometry — cosine and sine — to compute the new start position for the slice. After computing the start position for the pull-out slice, we then draw the text label, which consists of the label from the table (e.g. “SuperWidget”), along with the value (e.g. “$1862.12”) and the percentage of the total value. Most of this code should be self-explanatory. context.fillText() expects the text to draw, followed by the X and Y coordinates of the point to start the text. Again, we compute these X and Y values using cosine and sine, adding a bit of padding (pullOutLabelPadding) to the distance from the centre to allow plenty of room for the label. If the slice isn’t a pull-out slice then we just set the slice’s start coordinates to be the centre of the pie. Our gradient fill adds a bit of extra pizazz to the chart. We use context.createLinearGradient() to create a gradient running from the top left of the canvas to three-quarters of the way across and down the canvas. Then we call addColorStop() on the gradient to add 2 colour stops: the gradient start colour at the start of the gradient ("#ddd", or light grey, in our settings), and the slice colour at the end of the gradient. To draw the segment, we first start a path by calling beginPath(). Then we move to the start point using moveTo(), then draw an arc using arc(). This function draws a straight line from the current position out to the start angle of the arc, then draws the arc to the end angle. We then complete the segment shape with another lineTo() back to the start, and finish the path with closePath(). Then we specify the gradient for the fill style, add the drop shadow if it’s a pull-out slice, and call fill() to fill the slice. The last argument to arc() — false — tells the function to draw the arc clockwise instead of anticlockwise. The shadow colours are specified using rgba format, where the last value is the opacity. So "rgba( 0, 0, 0, 0 )" draws the shadow with zero opacity, effectively turning off the shadow when it’s not needed. Finally, we draw a thin white border around the slice if it’s a regular slice, or a thicker dark border if it’s a pulled-out slice. We get the widths and colours from the variables we created in the init() function, and set the context.lineWidth and context.strokeStyle properties accordingly. We then draw the border by calling context.stroke(). This is a bit of a mishmash of various easing functions I found on the web, and frankly I’m not entirely sure how it works, but it does. 🙂 The basic idea is that you pass it the ratio (how far along the path the slice currently is), and the power (how abruptly it should slow down). The function then returns the new ratio, adjusted so that the slice takes bigger steps at the start of the animation, and smaller steps towards the end. There’s some great info on easing functions over at ActionScript.org. The finished pie chart with a slice pulled out. Nice! Lovely and smooth. No problems here! Fairly smooth, but no drop shadow on the pulled-out slice. It seems that, with the current WebKit, you can have a gradient or a drop shadow on a canvas path, but not both, since the drop shadow appears if you turn off the gradient. Pretty damn slow, but then so’s the rest of my phone since I upgraded to iOS 4. (Thanks Apple!) I’m guessing it’d be acceptable on an iPhone 3GS or 4 – comments anyone? I hope you enjoyed this journey through the world of the HTML5 canvas element, and found it useful! I certainly learned a lot while writing the tutorial. Demo works on iPhone 3GS. Slightly jittery, but perfectly usable. Sweet! I also tried it on the Android emulator yesterday and it was very slooooow (probably cos of the slow Mac it was running on), but it did work! pi-(pi/2) = pi/2 = pi*5/2 and so on.. But other than that the code works very nice indeed. Very nice commented and very nice result! Good job! @Nitzarn: Not sure I follow. pi/2 is 6 o’clock since it’s working clockwise from 3 o’clock. So 12 o’clock is -pi/2. The code seems to work OK to me! Yes I also agreed that the code works, just wanted to point out that from a strict mathematical view, angles are counted counter-clockwise as the positive direction from 3-o’clock. However the code works great! Very nice Tutorial. How about live data manipulation and slice growth? @matt: Yes live ajax updating. I have been searching for so long and tried many of the flash charts (flash charts pro, fusioncharts) and js charts. With all you can update the data set, however it redraws the entire chart. I am in need of an actual live growth from old point to new point. no one offers this. Once you receive the new data values then all you’d need to do is update the HTML table and chartData array, then call drawChart() to update the chart itself. Yes, that is the easy part, the part that no one has is the dynamic ‘growing’ effect. the chart should visually grow and shrink slices based on new values. @stevebor1: That’s what would happen. You’d just call drawChart() to redraw the chart, which will grow and shrink the slices. Its wonderful to see the demo and the clarity in he images – HTML5 and Juery are terrific. I was just tying to get a mouseover version of the above rather than a clickable version..
Also any plans of candle stock charts in the same? Then you’ll need to modify the handleChartClick() handler to manually detect (using math) if the cursor has just moved into or out of a slice. If it has, then pull out or push in the slice as appropriate. This is a fantastic tool, however, once I finished testing it and tried to put it into our actual web-based program the pie pieces stop moving in and out when clicked (name and percentage pop-up text do not appear either), and when you click on the menu on the right the pie piece attached to it disappears. I’ve traced the issue to the prototype.js file that we have hooked up to the program, but I have no idea where to narrow it down from there. Has anybody come to this brick wall before? I really want to use this chart and would hate to not be able to due to something like this. Thanks in advance! Thank you for your reply, Matt. We knew that prototype.js was a pain, and we had tried the jQuery.noConflict() before too… but you got us thinking about checking on a new version of jQuery, and we found out that our version was 1.4.1. We upgraded to 1.6.1, changed some of our Ajax calls, and now it works like a dream. If this wasn’t an offline project that needed to be self-contained we’d just link to an online jQuery library and always have the newest version, instead we’ll just have to be diligent and continue to check jQuery.com. Thank you for your quick assistance! You rock! Silly question here: We have a pie chart where the pie pieces are 2000, 60, and 3. The 3 pie piece shows up as “0%”, and it’s piece on the whole pie does not show any color because of this, making it appear to not be there. 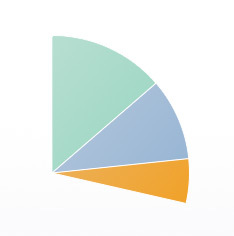 Like I said, silly question, but can we somehow get that pie piece’s color to appear even as a sliver on the chart (we can see the “3” in the key on the side, we just want to see that bit of color in the pie itself)? Thanks! @cross01: Here’s a reworked chunk of the init() function. It’s a bit of a hack but should give you a starting point! That seems to be exactly what we’re looking for. Thank you again for your help! The pie chart is not showing up in IE 8 for me. Just to make sure it wasn’t my modified code, I uploaded the source file and still not showing up in IE 8. Has the explorercanvas api changed? @rexonms: Strange! It worked fine at the time I wrote the tutorial. Could be a problem with the version of excanvas and/or jQuery that the tutorial links to. I can sometimes get it to work by reloading the page. It’s intermittent. You could try downloading the latest version of excanvas (r3) from http://code.google.com/p/explorercanvas/ and installing it locally. That might fix the problem. Also try linking to the latest version of jQuery (1.6.2). I love your pie charts and the tutorial(s). I’ve made some modification to your pie charts and in the end, I’ve got a funny thing happening that I thought maybe you could help me with. I’ve put your pie chart in an ASP.NET page, it works fine (using function pageLoad(sender, args) in the scripts so that it reloads after an AsyncPostBack update). Then I replaced your table with a <asp:Gridview> inside an UpdatePanel. What I want to do is change the table data, and thereby the pie chart on the page. And it works. Here’s the problem, I’ve got ghosting. More than that, sometimes, when I click, I get the old pie chart back. But more often, which I click on a piece of the pie, I sometimes get a quick flicker of the previous pie chart, and the slice of pie that is moving is the old slice (in the flicker) and the current slice moves as well. And like I said, sometimes I get the swapping of the pie charts altogether. In fact, every click will toggle me between pie charts when it’s in that state (might have to do with where the mouse is). It’s all very cool if that was what I wanted, but it’s not. Do you know what needs to happen to clear the other pie chart out of memory so the new pie chart will function without the ghost haunting us? I think that will fix it but I’m not sure where that should be done. Thank You. 1) Your table is somehow changing all the time, so that the data that my pie chart code reads is constantly changing as it draws the chart. Thanks Matt, for your reply. It’s been an interesting working with your pie charts. The solution to my problem was to unbind all the #chart ‘click’s prior to defining them, that way each new pie chart gets a fresh start. It works very well, thanks for your post. I’ve learned a lot by manipulating and changing the charts. great tutorial! thanks for sharing. OK now I would like to know the next step to achieve my goal. Could you help? Thanks Matt! @akos: Can you not just call init() to redraw the chart? Great piece of work and tutorial 🙂 I’m looking to adapt the graph slightly. I want each piece of pie to have its own background-image attached to it. Is this easily done? No idea if this would work but it’s all I can think of right now! I need one pie chart after another on the same web page. The first table i gave an id of chartData as in the example but what would you call the second ? Is there any simple way to do this so they both work or does the code need a some re writing/enhancement. @dklugmann: The easiest, if hacky, approach would be to put 2 iframes in your page, and load a separate pie chart page into each iframe. The more elegant, but long-winded approach would be to rewrite all the pie chart code to hold an array of charts, each with their own arrays of data and their own canvas elements. Thanks. I appreciate the response and thanks for writing some great code in the first place. You’re welcome, David! I hope you manage to get it working. Did you ever find the answer why this doesnt should an image under ie8 ? Looks great in frefox but nothing in ie8. I think the ie7 and ie8 issues are a timing issue. was giving undefined as the canvas element had not yet loaded. I changed the call to pieChart() to be called via a body onload. it then works in IE. Hope that is of use to someone. great work, I have one query w.r.t this graph , when I use mousemove instead of click event for handling the movement of the slices in pie(for moving the pie pieces while mouse hovers over it ) the pie pieces movement isn’t smooth . Can you give me some suggestions on it. First of all, thanks for this great guide. It has been really helpfull. I’m am trying to pull out several slices with the help of checkboxes, but i kinda get stuck on that end unfortunately. I wonder if it’s possible that as soon as i check several boxes, several slices will pull out. And as soon as i click the slice itself, or the informatie in the table only that one will remain. i hope it’s not that big of a deal to help me out. @Dum_Di_Dum: Hard to work out what’s going on by just reading code. Please post the URL of your chart page so I can take a look. Ofcourse i can URL my chart, sorry about that. As you can see i create an checkbox behind every row of the table. My actual question is if there is any possbility that you can pop out the slices of every box that is checked. This is awesome, however it bugs out if there is an entry of zero – do you know of a way to fix this? @Dum_Di_Dum: Please post the URL. @cdavidson: A data item of zero works fine for me. Please post the URL of your page with the problem. nice work.I’m fresh to jquery,so i juz want to know how we can get the values from an external database(like if a json is there),instead of the table.i have searched but most of them gives a vague idea. 1) Pull the data from the database in your server-side (PHP?) script and generate the markup for the page, including the #chartData table. hi can i know wt sholud be done to make above pie chart as a drill down pie chart..
@maxbye3: I’d need to see your whole page and code really. Can you post it to http://jsfiddle.net/ ? Bear in mind that, if you’re populating your data table dynamically with JS, you will of course have to run the pie chart code after you’ve populated the table. Thank you so much Matt for this great stuff. I am quite new to jquery, yet. I am trying to create the pie chart a little more dynamic. But ending up having the new chart overlapping the previous chart, and I can’t remove the .data(slices) from the previous chart. I am new to jquery. Please let me know how I can clear the chart datas completely before I can add new chart slices. I don’t totally understand what you’re trying to do, but I’d imagine the easiest approach would be to add/remove rows from your data table as needed, then just call init() again to reinitialise the chart. Does that not work? You’re an absolute star for helping the community like this. I’ve re-read my previous post and it’s not clear at all – hopefully this makes more sense. // Gives an output of 8364 <- so it works. It’s displayed but not recognised by the pie chart, any idea what I’m doing wrong? I’ve put my code on JSFiddle (http://jsfiddle.net/qmrpG/5/) if you could point me in any type of direction. I would highly appreciate it. Thank ya. Thanks for the code! It’s exactly what I was looking for. //  into .01% of the total. Otherwise, ExplorerCanvas will draw over the whole pie. Thanks so much for the help. I figured out what was going wrong. I had to initialise draw chart inside of the retrieve data function. Anyway, thanks for all the help and I’ve just brought your book! @starter: Hmm, I’m not sure why that would happen, since every time it draws the chart it clears the canvas (in the drawChart() function). If you can post your chart page on jsfidde/jsbin then we can take a look. Hi there, I would like to display the chart with data that are extract from ms access. Is it possible to do it in here? I love your chart, thank you very much for putting it together. I am wondering if there is a way to change the spacing between the label and the value? @april_r: In the table, or the chart? @matt: I just looked over the compatibility chart again, and your note about needing to click to the left of the chart in IE7 sounded similar to or possibly the same as a problem I’d had with it as well. To fix it, I just used jQuery’s .offset() method to get the position of the canvas instead of calculating it myself. That gave me the correct offset in all the browsers I tried. Happy days. Thank you, that is what I needed. This chart is amazing.. i need to add another columns to the table , however when i added another 2 columns , the chart does not work. Appreciate your help on this.. The chart is very nice. But, i have some issues and need suggestion from you. Actually in my page, the click event on chart does not work. I think the problem is with div element of the chart. Because if i click outside of chart in the canvas, the toggleslice is called but when i click on chart it does not work. Any suggestions? From the table chart handler works perfectly fine. If you want i can give you my page. Also, I need to display 3 charts on a same page. So do i have to write 3 different init functions or is there any one function that works? @sampada: Can you post the URL of your chart page so we can see the problem? The code above will not work if the canvas is inside a <td> for example. Thanks so much for the article and great sample code. I want to make sure I give credit where credit is do. Can you provide the copyright attribution text you’d like me to use in my about page? Amazing job, thank you very much! I managed to understand most of the code and to implement it. A question please, if i want to replace the text about each slice with a picture, how should i do it? Again, Great job! thank you! @missing: Just something like “pie chart code courtesy of Matt Doyle” (with a link to the article) is fine! Thank you for this tutorial. I have a question regarding the colors. My chart is created dynamically from my DB. The problem i am having is I can not dynamically change the <tr style=”color: #>? Thank you for sharing! This chart is fantastic, and exactly what I was looking for in my current project. I just have one question… is there anyway to currently control the opacity of the slices (pulled out and inactive) ? What I need to do is essentially add opacity to the un-selected layers so that the selected slice is focused on by its opacity in comparison to the others. (my product manager would rather do that than toggle each slice). @vinsite54: I’d need to see more context to answer your question. How are you pulling the data from the DB? If you’re using Ajax then it should be fairly easy to use JS to change the tr elements as well as the chartColours array. @jffgrdnr: Glad it helped! You should be able to just replace the rgb() notation in drawSlice() with rgba(), where ‘a’ is the alpha (opacity) value you want to use. ‘a’ ranges from 0 (completely transparent) to 1 (completely opaque). The pie chart works awesomely, however it clash with Shareaholic scripts. When Shareaholic script is installed, the piechart will have problem drawing the pullout slice, it will just show blank for that slice. After diving into the script, I made a one line change in function drawChart(). Hopefully this will help other who face the same problem. HELLO thanks for this lovely article, my question is i want to display the info (in this case widget …) into one place for example in a little zone just under the pie . Great Work!!! This is what I am looking for my current project. I wonder how to change the dollar sign into other currency symbol when I pull up the slice by clicking one of the rows in the table? – I wish I could feed the digital values of those four variables calculated following the seizure of the user. First of all pie chart works awesomely, however I have one question…. I would like to know how to detect which of pullOutLabel’s (pullOutLabel or pullOutValue) is clicked when slice is pulled out, and then to redirect to other page depending on which one is clicked. I m pretty new to jQuery so would appreciate your help. Do you think it would be possible to scale individual slices instead of the whole pie? 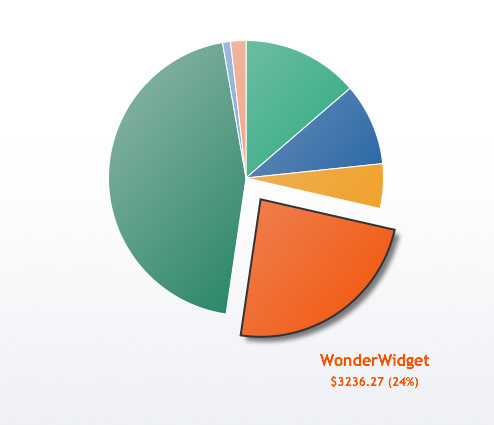 however I just have one question..
how to add links to pie chart slices ? I would highly appreciate it. Thank you. It’s a tutorial, the idea is that you use it to learn more about programming by adding your own features to it. And if you want come back, and tell everyone how to extend it’s functionality. To include a block of code in your comment, surround it with <pre> ... </pre> tags. You can include smaller code snippets inside some normal text by surrounding them with <code> ... </code> tags. Allowed tags in comments: <a href="" title=""> <abbr title=""> <acronym title=""> <b> <blockquote cite=""> <cite> <code> <del datetime=""> <em> <i> <q cite=""> <s> <strike> <strong> <pre> . Need a little help with your website? I have over 20 years of web development experience under my belt. Let’s chat! Subscribe to get a quick email whenever I add new articles, free goodies, or special offers. I won’t spam you.